Need to reclaim your living room? Ready for a modern home makeover? Would $25,000 help? All Modern presents their Unleash Your Chic Side challenge! 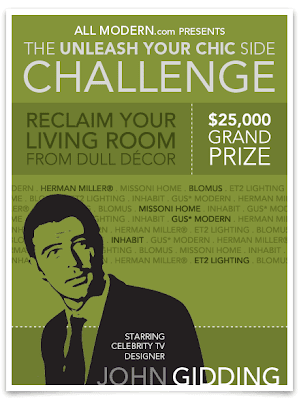 The $25,000 grand prize consists of a modern living room makeover by John Gidding, plus furniture and accents from Gus Modern, Herman Miller, Missoni Home, Blomus, ET2 Lighting, and Inhabit. Enter now and you're an instant winner with 10% off your next order! Tell them why you want to infuse more modern style in your living room, and how a $25,000 makeover from AllModern.com and John Gidding will help you unleash your chic side. Grand Prize: $25,000 modern living room makeover designed by John Gidding, including new seating, lighting, accessories and more! Second Prize: $2,000 worth of modern accents and accessories. Third Prize: $1,000 assortment of modern accents.